One of the most fascinating sections of this finely-crafted memoir concerns Phyllis’s career during World War II. In particular, Eales explores the possibility that Mother worked with both the British and the Dutch intelligence services, in London and in Arnhem, and that she was involved with code-breaking at Bletchley Park. I will not reveal Eales’s conclusions. Echoing themes in Foyle’s War, the British TV series, this award-winning memoir is about the author’s secret adoption in London 1947, and her search for her birth mother — a spy in world war two. Jane was 19 when she was told she was adopted and then sworn to secrecy, forbidden to find her biological family. Decades later, in response to tragic family circumstances, she begins a poignant search for truth and identity that would take her to Africa, Europe and Australia. Connecting with Paul, her half-brother, Jane began to learn about their enigmatic mother, Phyllis, an elegant, multilingual woman who went to a finishing school in Belgium. Joining the British military during WWII, Phyllis had been a driver for high ranking officials near Bletchley Park, earning her two war medals and the rank of Junior Commander by the end of the war. She was a member of the First Aid Nursing Yeomanry, the Auxiliary Territorial Service and, it seemed, a secret agent who was sent on a dangerous assignment to Arnhem. Jane, struggling with her identity and longing to know more, questioned whether this could possibly be true. Spies and Spotted Dogs was a Winner in the Autobiography/Biography category of the 2015 Next Generation Indie Book Awards in New York on the 27th May, 2015. This award program is the largest not-for-profit book awards program open to independently published authors worldwide. Now an award winning author, Jane was born and adopted in London, in 1947. Her family emigrated to Zimbabwe, where she grew up, and at 18 she left home to live in South Africa. She met Rob there, and they married in Oxford, returned to South Africa, and ten years later in 1980, they emigrated with their family to Sydney Australia. When she met her biological family in 2005 she stopped work. She was flooded with family stories, and as a way of making sense of everything, she began to write. As layer upon layer of family history emerged, she was often asked ‘why don’t you write a book?’ and Secrets, Spies and Spotted Dogs is the result. A serendipitous outcome in her search for identity emerged in 2008 when she began to draw and paint. Jane Eales was 19 when she was told she was adopted and then sworn to secrecy and forbidden ever to search for her biological family. Decades later, tragic family circumstances drove Jane to find her true identity, leading to the stunning discovery that her birth mother had been a British spy. 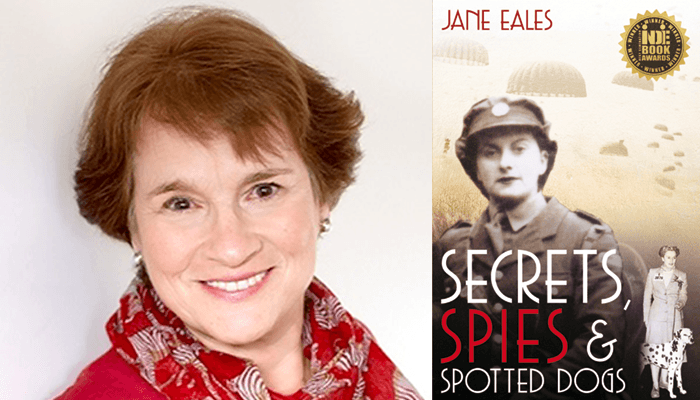 Secrets, Spies and Spotted Dogs interweaves the raw emotion of adoptee discovery, the heart-pounding threads of WWII espionage and Jane’s own poignant search for truth and identity.